Ok, it's actually pink polka dots, but that's besides the point! This is my first time wearing a bikini and it went a lot better than expected. I've had this sort of chubby, curvy body for as long as I remember, but my self-confidence has wavered with it. Fast diets, apathy and begrudging acceptance have all happened at one point or another. This was always me and I was never ashamed...but I wasn't proud either. It's only now, in my late-twenties, I've become comfortable in this body, just as it is. That's not to say I don't want to exercise more or eat healthier, but I feel good and I feel like I look good, curves, rolls and all. I've officially become less self-conscious about drawing attention to my body and being afraid to look less than what society deems "perfect." There's one photo I included that is less than a "perfect pin-up." My face is frozen mid-laugh and the side of my belly rolls in multiple places. It happens to be one of my favorites because I look so darn happy. This has been a crazy year and getting back out there after a break-up has helped me examine my confidence and self-worth. I realized I don't need anyone to tell me they like the way I look. I like the way I look and that's what matters. I've also taken great leaps in conquering anxiety that flared up this past year. It feels good to be mentally healthier in more ways than one. The bikini itself is by Unique Vintage, who has become a site pretty close to my heart. They treat bloggers well and have a positive message to their brand. This particular suit fits perfectly on bottom, but a little off on top. None the less, I feel wonderfully confident in it. They have a ton of adorable suits for the summer season. Girl, you look GORGEOUS!!!! These pictures are amazing!! The swimsuit looks great on you and this photo shoot is super cute! I also love that bag! Oh my goodness - you look amazing. Kristina you look gorgeous! Your styled posts never fail to make me smile and I love this cute bikini. 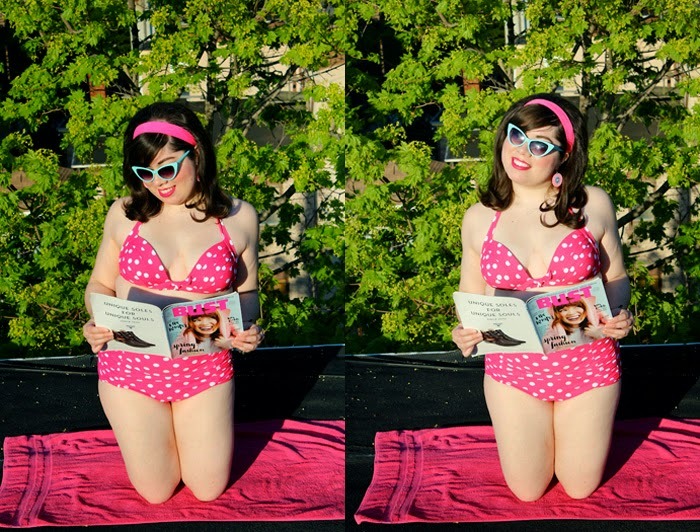 There's nothing like lounging in the sun with fabulous sunglasses and a good read, right? How splendidly cute! You look sensational and beyond ready to greet summer with open arms.